Last September the Photo Detective Maureen Taylor was on Fieldstone Com mon. During that interview she made a News Breaking announcement regarding her plan to make a documentary film about The Last Muster. Just last week Maureen and Verissima Productions initiated a Kickstarter campaign to raise seed money for the project. This is project that I believe in. I’ve already made my own pledge. 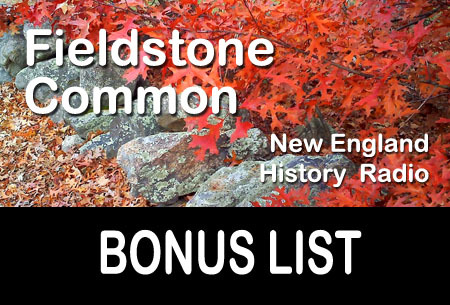 I hope that Fieldstone Common listeners will consider supporting this worthwhile project. To encourage that I’ll be raffling off a copy of The Last Muster. To be eligible to win the book you’ll need to pledge $25 to the kickstarter campaign by Thursday, March 14, 2013 at 6pm. After you make your pledge leave a comment here or send an email so I’ll know to include your name in the raffle. After 6pm one name will selected to win the book. Following are some notes on items that were mentioned during the 27 September 2012 Fieldstone Common interview with photo detective Maureen Taylor, author of The Last Muster: Images of the Revolutionary War Generation and Fashionable Folks Hairstyles 1840-1900. You can learn more about Maureen Taylor at her website and you can follow her on Facebook, Twitter and Google+. Maureen has been writing the Photo Detective column for Family Tree Magazine since 2001. Big AnnouncementMaureen made a big announcement during the interview. She revealed that, in conjunction with Verissima Productions, she will be making a documentary of the based on The Last Muster book. The documentary, which is currently in the fundraising stage, has its own website so that you can follow its progress. Maureen also announced that volume two of The Last Muster will be published around June 2013. Kent State University Press, the publisher of The Last Muster, donated two copies that were given as a door prizes. A big thank you to Kent State University Press for their generosity! I still have two books to give away from the interview with Maureen Taylor on Thursday. Here’s a chance for podcast listeners to win a door prize! 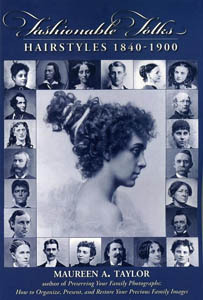 The first book is Fashionable Folks Hairstyles 1840-1900.List price $19.95. What did Maureen call the little curl that hangs down in front of a woman’s forehead? To win the book Fashionable Folks Hairstyle 1840-1900 be the first person to send an email to radio@FieldstoneCommon.com on or after 5pm EST on Sunday, September 30, 2012. The first correct entry received will win the book. The second book is The Last Muster: Images of the Revolutionary War Generation. List price $45. Which photo in The Last Muster was Maureen’s favorite? To win the book The Last Muster be the first person to send an email to radio@FieldstoneCommon.com on or after 8pm EST on Sunday, September 30, 2012. The first correct entry received will win the book. You can enter to win both contests but if a winner you will only be selected for one book.Don’t forget to include your name in the email. If you have any questions leave them in the comments below. Winners will be notified by email. 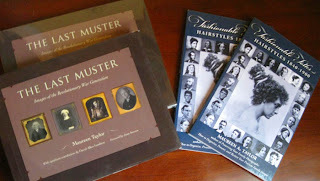 The most recent episode of Fieldstone Common featuring photo detective Maureen Taylor talking about her books The Last Muster: Images of the Revolutionary War Generation and Fashionable Folks Hairstyles 1840-1900 is not available as a podcast. Don’t Miss these Door Prizes! I’m getting the door prizes ready for tomorrow’s Fieldstone Common show with Maureen Taylor, the Photo Detective! 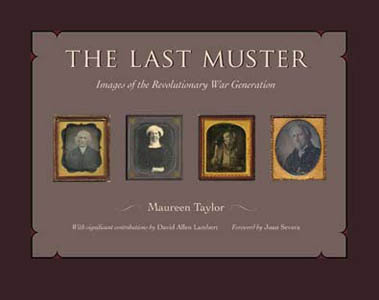 We’ve got two copies of The Last Muster: Images of the Revolutionary War Generation to give away (list price $45 each!). These are hard cover books. And we’ve got two copies of Fashionable Folks: Hairstyles 1840-1900. These trade paperbacks retail for $19.95 each. I’ll be giving away one copy of each to the live audience during the Thursday show. Then for those of you who can’t listen live, you’ll have a chance to win after listening to the replay over the weekend. Stay tuned for more details on that. Listen to Fieldstone Common this week as host Marian Pierre-Louis talks to Maureen Taylor, the Photo Detective, about her books The Last Muster and Fashionable Folks Hairstyles 1840-1900. 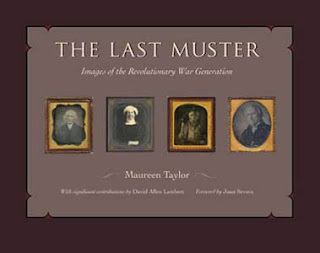 The Last Muster is a collection of rare nineteenth-century photographic images of the Revolutionary War generation. This extraordinary collection of images assigns faces to an un-illustrated war and tells the stories of our nation’s Founding Fathers and Mothers. The array of seventy images is expansive and includes veterans, loyalists, Native Americans, African Americans, children who witnessed battles and aided soldiers, and women who nursed the wounded and even took up arms themselves. Maureen investigates photographs the way private eyes investigate cases. She discovers stories behind family pictures by following clues … a hat, the shape of a woman’s sleeve, or a sign in the background. 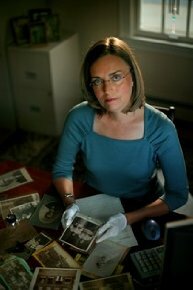 Through her website, PhotoDetective.com, Maureen offers practical, affordable advice on how to save and organize photos. She also writes about the latest photo-related topics, products, and media coverage on her Photo Detective blog. Visit the Fieldstone Common Radio site and sign up to “follow” the show so you will get a reminder about the upcoming episode.